Wow. Absolutely blown away. 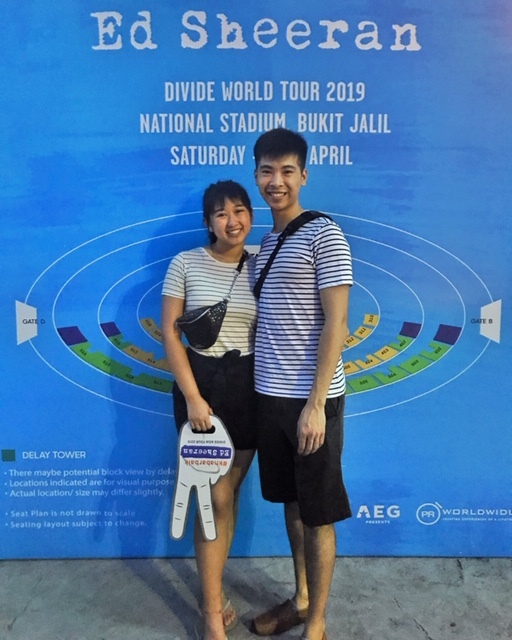 I just left Ed Sheeran’s 2019 Concert Tour at National Stadium Bukit Jalil and just wanted to pen down my feelings. The concert opened with Japanese band, One Ok Rock, which truly held their own, filling the stadium with head banging Jap-English songs that I most certainly haven’t heard before but couldn’t help but enjoy. 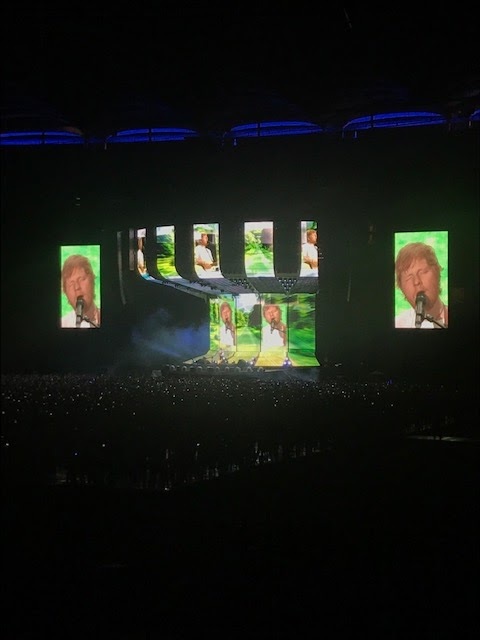 But when the opening act walked off stage, the lights dimmed and Ed Sheeran came on, the stadium shook with the cheers of us concertgoers. No introduction necessary - he immediately launched into Castle on the Hill, his only accompaniment being the amazing digital screens behind him, flashing glorious greens and blues. Song after song he played, somehow conveying more depth and emotion in every one than any of the album renditions. Between the songs, his sincerity shone through. He greeted us. Talked about his previous performances in Malaysia. Said we were his loudest crowd in Asia. He charmed the crowd - those already fans, and those who were just there to accompany other fans. 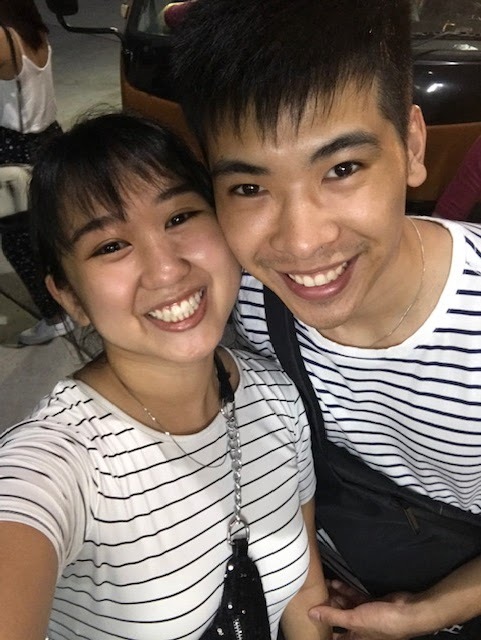 He made a tribute to the Dads and reluctant boyfriends of the crowd, threw in a joke about his random appearance on Game of Thrones, and even shed his white tee for a Harimau Malaysia jersey for the encore. But more memorably, and the reason I’m jotting this down, is that he sang each song like a story. The opening would come together as he played different bits on the loop pedal, giving us time to guess at what song would be next. He convinced us to lose our voices because he would lose his too, having a few days off after this concert so he felt he had an excuse to push his voice. He might’ve lied to us, but we all listened anyway, the voices so loud it was deafening. The songs built up to a climax, bass notes leaving hearts thudding and attention rapt, and each song concluded with a short speech/ conversation with us in the crowd before his next song. He went acapella and his voice filled the stadium, no flashing lights or dancers necessary to leave us hooked on every word and melody. I was enraptured, sitting at the edge of my seat, when his voice stretched high and low, his range going further than I’d ever heard on his recorded songs. 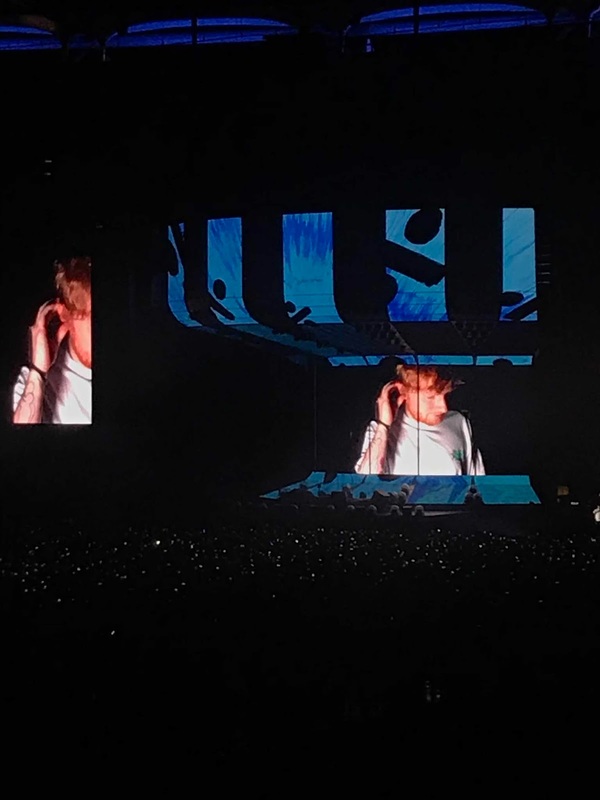 Although the tour was for his latest album, Divide, we got to hear gems like A-Team (a song he’s played at every concert), Kiss Me, Love Yourself (he wrote but sang by Justin Bieber), Tenerife Sea and Sing. He was a true showman, his energy high in every song - he must’ve been so tired but didn’t let it show at all. I mean, I was seated and even then I felt tired. I can’t even name his best song, because his talents stretch so wide. When Thinking Out Loud, Photograph and Perfect came on, the crowd sang loudly, collectively. Don’t and You Need Me Man I Don’t Need You left us all awed, the words flowing out him without a stutter, the lyrics clever and precise. With his only backing track being himself through the loop pedal, he harmonised with his own voice many times over, his songs filling the stadium with soul. I had such a good time. I’m so glad I got to hear him in person. I think Boyfriend and I have lost our voices, scream singing every word we knew. Just some logistic information, no water bottles, umbrellas or big cameras allowed, but we didn’t need to worry as there were food trucks stationed inside the stadium. Water bottles went for RM2 which is fairly reasonable. We bought a parking pass for RM30 which is how we managed to get out of the stadium so quickly - hence how this post got penned so quickly too! Here’s the set list from Japan. I think it’s the same as the Malaysian one with Shape of You and You Need Me, I Don't Need You to close as encore. I’m finally penning a non-sponsored post. To be honest, although I love writing and talk a mile a minute, it can be pretty difficult to decide to put down the iPad or book or whatever it is that I’m currently into, to sit down and write something. Unless they’re giving me something free. Or I’m getting paid to do it. Does that make me a sell-out? Sigh, kinda. But for some reason, being sponsored gives me an illusion of credibility. Like, if someone’s job is to give me things to get me to write something, then I must be doing something right… right? In reality, when you’ve found yourself a blogging network or you land yourself on enough PR lists, there will be opportunities to write for companies - some you love, some you’ve never heard of but turn out to be great. And I gotta say, it’s incredibly gratifying to know that some companies believe in you enough to want you to represent their brand or want you to try their products. But I think I have to remember that at the end of the day, I started this blog to share my views, stories, experiences and if I withhold that genuine aspect of sharing in favour of only remunerated or sponsored views, where would I stand on credibility? Although it’s true that I only write what I want, and won’t share something I don’t believe in, there’s a compulsion to censor myself in my views to ensure that even the negative feedback is presented in a less damning light. This filter to make things sound better than they are is scattered across the internet to the point that even I feel tempted to only read really incendiary views, then add in my “optimist” filter which balances out that terrible view, i.e. man, this guy sounds really picky/ is expecting too much, etc. And this is reflected in the reviews I write about a product! My friends would message me after I share something and ask – eh, this really legit ah? I mean, if my friends think that I’m going to give a more ‘honest’ view when messaging personally than via my blog, I guess it does come across like the blog is a little less credible. 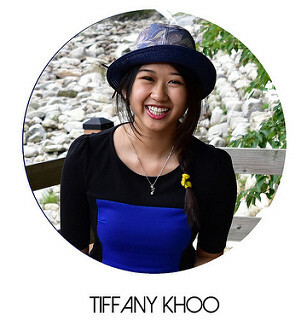 With that in mind, and a renewed “I can do anything I set my mind to” attitude (I’ve been reading Rachel Hollis’ newest offering – Girl, Stop Apologizing - so forgive me if I start overflowing with goals-digger vibes), here I am sharing my thoughts on Yoodo - a phone line I swapped to after over 10 years of unwavering loyalty to Maxis. There’s been a lot of these ‘lower budget’ customisable telco offerings as of late, Yoodo by Celcom being one of them. Some others include Ookyo by Maxis (only for Android) and MCalls. I went with Yoodo after my Maxis 128 plan expired because Boyfriend’s been using Yoodo since he came to Malaysia and is generally pretty pleased with it. Onwards to the Yoodo review! I need to first talk about setting this up. When you first download the app, they give you an option to Order a SIM or Activate a SIM. If you click through to Order a SIM, you can then decide whether you want to start customising your plan or pick a free SIM. They then get you to create an account (pretty standard stuff), fill in your address and they'll send over a card! I recommend doing this earlier because it can take about a week to arrive and you don't want to start severing ties with your existing telco before you have the SIM card in your hands. Once the SIM card arrives, you can then Activate your SIM and choose your number! I wanted to keep my Maxis number so that meant I had to port over. However, my phone number is a subsidiary number under my dad's account which added a layer of complexity to the process. In order to swap over to the principal line at Maxis, I would have to pay some sort of fee. Which, being cheap, I didn't want to. So I just made an account on Yoodo with my dad's name, IC and photograph so my number could be ported over to Yoodo. Once I did that, it took about 48 hours for my new Yoodo SIM card to be active. Bear in mind that until your old line is terminated, you won't be able to use your new Yoodo line, so I suggest holding onto both SIM cards till you're sure that the new line is active. It's actually a super easy process - I thought it would require a lot of form filling or annoying bureaucracy but all I had to do was key in the number through the app. The hardest part was getting my dad to help me out with the e-KYC (involved him having to take a photo to link him as the owner of the IC). At one point, Maxis gave me a call to ask me why I'm swapping over. I told them it's because I wanted a cheaper plan. They half-heartedly told me that their plans aren't too expensive, then when I was certain I wanted to port over, it happened very quickly after. So here's the real deal - why I decided to go with Yoodo. I loved that I could customise my plan monthly. I know that some months will be a lot more data-intensive for me because I would be travelling out of state, or some months would require very little data since I wouldn't be in the country and I wanted to be able to accommodate that. The flexibility of being able to change my plan every month down to how many texts I would get or minutes of a call I need PLUS the chance to top it up without hassle if I burned through my quota earlier than expected really spoke to me. I severely misjudged the amount of data I would use on general web-surfing. So as you can see, I signed up for app-specific data packages which were really cheap, but if you're on Facebook and click on a link to a site, the data allocation stops tracking it as "Facebook" data, but instead, takes that use out of your normal data. Which I suppose makes sense, but I was hopeful that I would be able to rely on the app-specific data combos. Eventually, I had to top up with another 3GB in the middle of the month for RM8, bringing my total plan expenditure to RM53 in March. You can see how cheap the app-specific data is here. I did away with so many of the app-specific data because I realised I burned through very little of it, and instead spent more on general data itself. I decided to do away with SMS entirely, which I hope isn't a mistake (I can always buy 50 texts for RM3 if need be) but I think this plan will serve me well for the month of April. Now, here's the biggest concern for everyone - coverage. Before swapping over, I was worried that I would experience periods of poor signal. I remember times when Boyfriend would not be able to get data and my phone was thriving on 4G while underground. That concern proved valid because throughout the month, there were patches of time where I would get no line as well as no data at all. I think Yoodo still has a couple of things to sort out in terms of the stability of its line. However, these periods of instability were few and far in between, perhaps about twice throughout the whole month. Nevertheless, they sent all of their customers an email with an apology for the patchy network along with a free 3GB for our next plan. 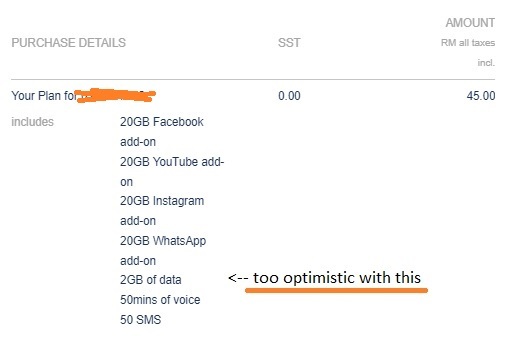 That's why for April, although I only chose 10GB of data, I have a quota of 13GB allocated to me. Ahh, there's nothing quite like young companies taking accountability for their shortcomings to build loyalty. Because of that, I'm willing to give it another go for the next month and would quite happily recommend this to those looking for a cheaper plan. I think Yoodo's ultimate strengths are its competitive pricing and flexibility. If you wanted a plan with 100GB a month, along with 50 minutes of calls, it'd only set you back RM103, which is a ridiculous steal. How can someone use 100GB a month?? Flexibility-wise, I really like how I don't have to get any SMS as part of my plan because honestly, does anyone use that nowadays - I sent a grand total of one (1) text in March. I also think it's great that I can boost my plan whenever. What I don't like is that I'm not confident that their plans will stay this cheap. Nothing's really stopping them from hiking up prices once it gets more popular. With this flexibility, they're at the discretion to up the price at any time, whereas when you sign up for a postpaid plan, at least you know you'll be paying pretty much the same price for as long as you're on the plan. Sigh, it's true - ClassPass' price hike gave me trust issues. I'm also a little wary of how stable the connection's going to be. It's great that they take accountability for the poor signal throughout March, which seems to indicate that they hold themselves to a higher standard (unlike certain Internet providers (yeah, Unifi, I'm looking at you) who make it sound like an everyday occurrence that your line is crap). Yes, it's one of those randomly generated codes that you can't change. I'm not hell-bent on sticking to this provider after realising how easy it is to change, so if you've got a telco that you absolutely love, feel free to share that too! Enjoying meals with Moringa Bioenzymes + Mini Giveaway! Chinese New Year was a real culinary celebration, with lavish spreads almost every evening over the 15 days that the lunar new year is celebrated. Abundance was the word of the season - abundance in wealth, health, food.. and weight? Yikes! Although I thoroughly enjoyed the 3Fs of food, family and festivities, it was a great relief to me that I had a little digestive help to keep the food down. I had my first bad case of acid reflux when I was 17. I was on the way to school to sit for my SPM paper when I felt a sharp searing pain at my chest. For a brief moment, I thought I was getting a heart attack! Maybe it was stress from the upcoming exam?? I quickly called my dad and he assured me that no, you paranoid teenager, you are not going into cardiac arrest and that what I was experiencing was most likely "reflux", or more commonly known as "heartburn". A glass of milk later and I was fine. This may be a little too much information for you guys but over the next few years, whenever I had meals that were a little too late or if I had too much spicy food, I would feel gassy or bloated and boy, oh boy, the farts were not pleasant for anyone around me. To add to that, I absolutely love anything cheesy, but when I have too much dairy, I belch in a way that would put Shrek in his place. 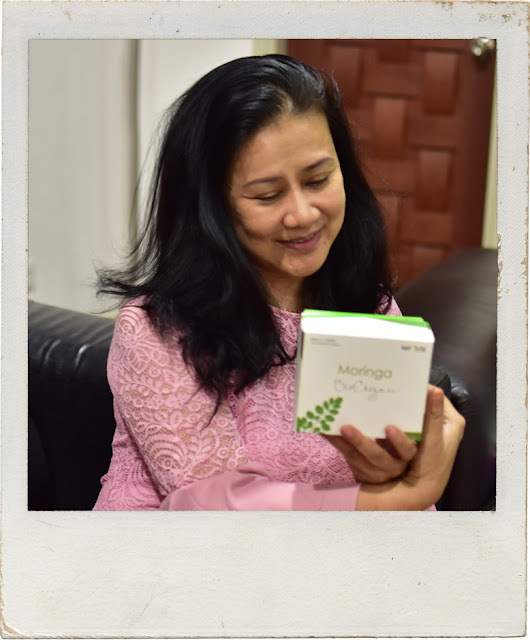 Unfortunately, I seemed to have inherited this from my mom, which is why I was particularly excited to partner with Iviora for their Moringa BioEnzymes when they offered to sponsor their product for both myself and my mom to review. When they found out how much my boyfriend and I love bonding over good food, Iviora generously also sent him a box for him to try. 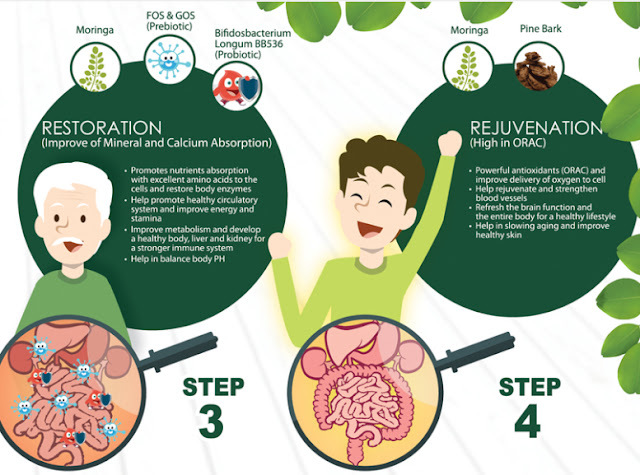 With all of us on board to give these bioenzymes a try, here's what we thought! For starters, what on earth is moringa? Dear friends, if you are as clueless as I was, allow me to introduce you to the core ingredient - moringa. 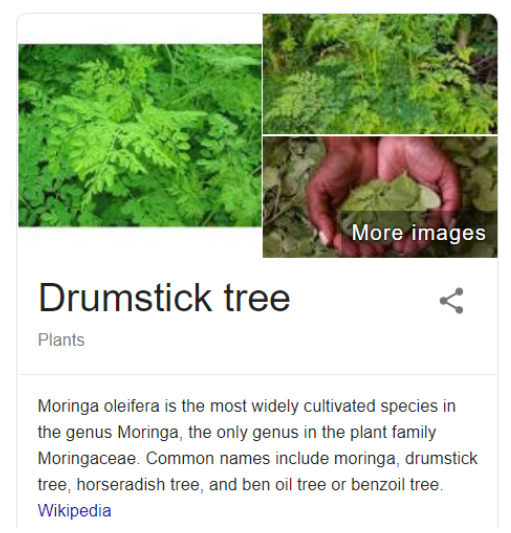 Also known as Drumstick tree. Click the picture for the Wikipedia page. There are a lot of uses for this plant and one of the reasons my mom, who's generally very sceptical about trying random food products, was willing to try this was because of moringa. According to Web MD, Moringa is used for - takes deep breath - “tired blood” (anemia); arthritis and other joint pain (rheumatism); asthma; cancer; constipation; diabetes; diarrhoea; epilepsy; stomach pain; stomach and intestinal ulcers; intestinal spasms; headache; heart problems; high blood pressure; kidney stones; fluid retention; thyroid disorders; and bacterial, fungal, viral, and parasitic infections. Phew - what a list! What do these bioenzymes do? 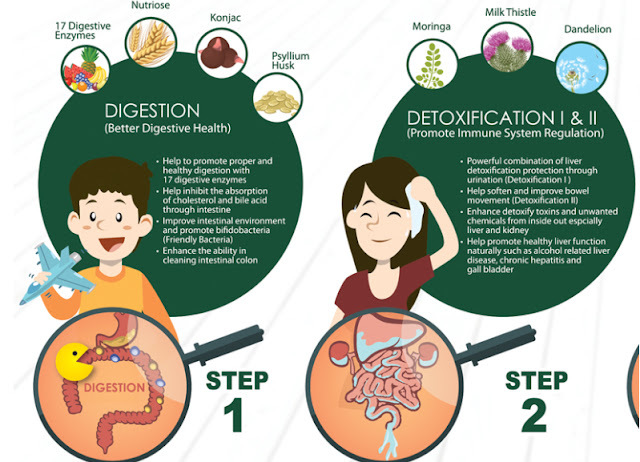 They claim to do 4 main things - digest, detox, restore and rejuvenate! Uh-oh. Normally, when we hear the word detox, the thought that generally comes to mind is that this is going to be a laxative, which I was really not keen on. I didn't want to interrupt my CNY festivities with frequent toilet visits - especially as I was planning to do a lot of open house visiting! I suppose then that another aspect that reassured me about trying this product was that it was laxative free, preservative free, all-natural and had no artificial colouring. So the green you see? All natural! Okay, okay, enough with the promo talk. How was it? For real? The first day my mom and I had it was after a very heavy meat buffet at Avenue K (holla if you know it! ), which left us feeling incredibly stuffed. 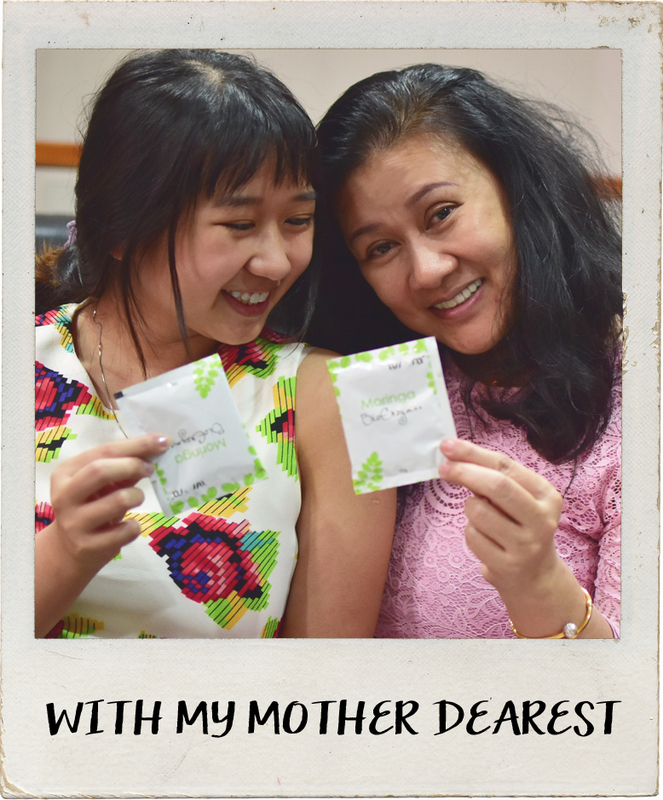 We mixed a sachet with a small glass (they recommend 150ml) of room temperature water (hot temperature kills the live bacteria!) and took a sip. Ever had kombucha? Well, it kindaaa tasted like that - slightly sourish and sweet. If I had to taste rank it, it started out as a 5/10 (which was pretty meh) but over the weeks I had it, it started to grow on me and now I find myself craving its taste hahaha so maybe it's now a 7/10. I had to stir the glass very enthusiastically for it to dissolve and even then, there were sediments at the bottom of the glass. Still, it was fairly fuss-free and quick to drink. I didn't feel immediate effects but when I woke up the next morning, I had no issues uhh.. going to the toilet. In general, when I have a lot of meat, I tend to feel a little constipated for a while, so I guess the enzymes helped get things moving. LOL and when I met my mom for breakfast, she said to me "wah, helps clean the system" which I suppose means that she had no issue with the toilet either haha. My mom actually found that it tasted quite nice, even from the first taste. I think it's because she has always been a fan of sour-sweet flavours so this suited her quite well. She particularly liked that it didn't cause diarrhoea, but still made her stomach feel cleansed and healthy. Over the next few weeks, despite all the heavy meals over the festive period, I was noticeably less bloated and felt that it helped regularise my bowel movements. I didn't break out at all, which is pretty incredible considering I ate plenty of oily food. 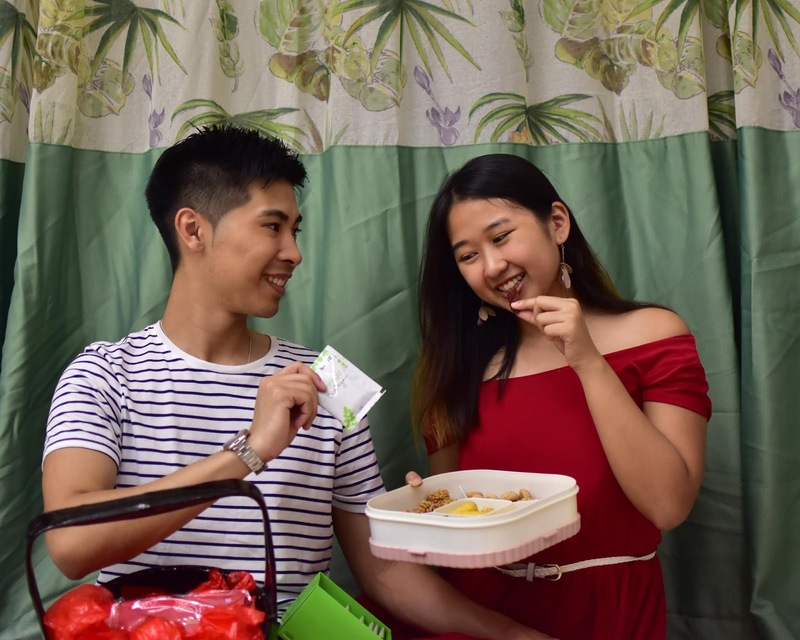 As for my boyfriend, we love trying new food together. 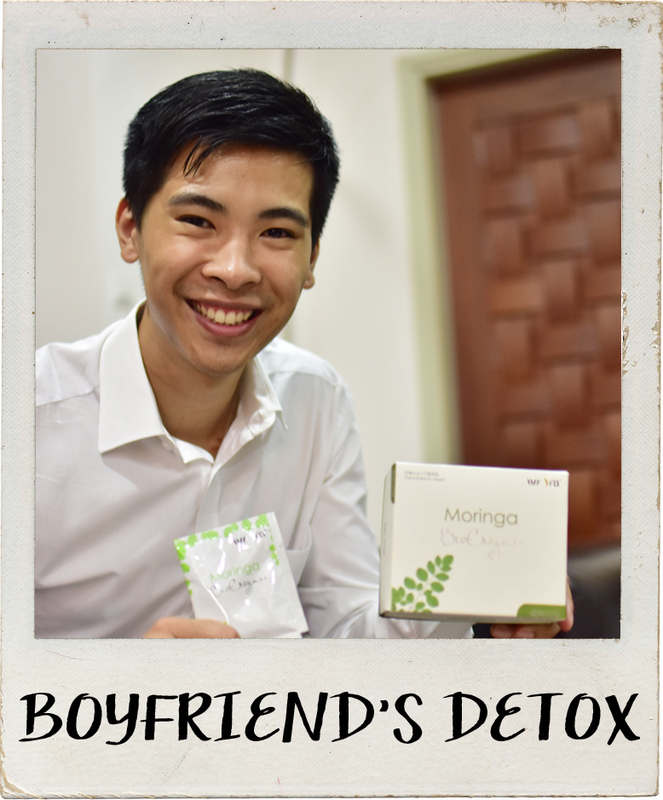 "I highly recommend Moringa Bioenzymes because it really does help with the discomfort after eating. The taste takes a few tries to get used to but it became something that I looked forward to during the day. It's very easy to make though the powder could mix in better as it tends to clump. I was sad when I finished my box, so I plan to keep it stocked in my kitchen!" But don't just take my word for it! 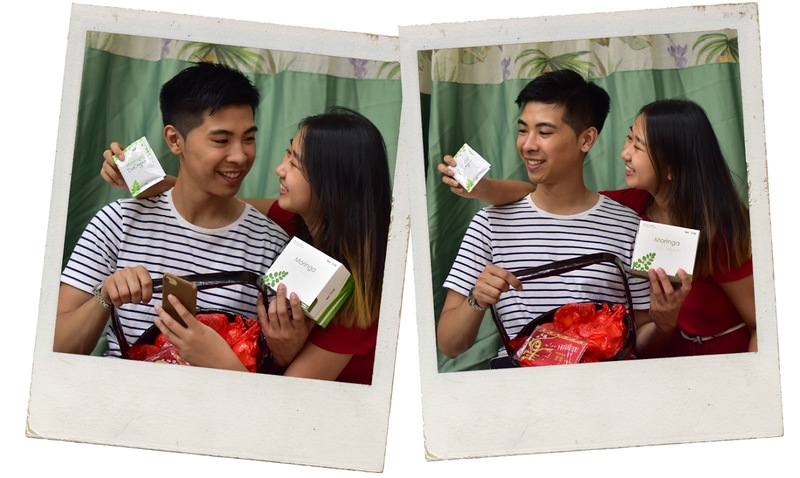 If you would like to try the product, here's a super easy-to-win giveaway for you with 2 product sachets and a discount voucher. Just post a comment on this post telling me why you would like to try it out AND drop Iviora's Facebook page a a private message saying "I want Free BioEnzymes Gift Set, Tiffany2019". My favourite comment will win! Deadline is on 7 March 2019 (11.59pm) on Friday. PS: Not paid for any of my comments, but I was given three free boxes of these to review! In 2018, I started paying attention to skin care. Perhaps it was stress, perhaps it was poor sleep, or perhaps it was the onset of new hormones your body delivers in your 20s - whatever the reason, I was breaking out and my skin was the worst it had ever been. For months, I was in denial. Somehow, I managed to convince myself that the sudden oiliness my skin was experiencing and the brash redness that spread across my forehead was temporary, and that with the power of hope, balance would be restored. At the time, I thought my infrequent experimentation with various cleansers and moisturisers would be sufficient to do the trick. After all, I told myself, it’s better than nothing. So I washed my face for a day and hoped for clear skin the next. I slathered on moisturiser one night and expected smooth skin in the morning. It's not surprising that it didn’t work. My skin was not used to being shocked with different types of chemicals one day, then a whole other regime the next. 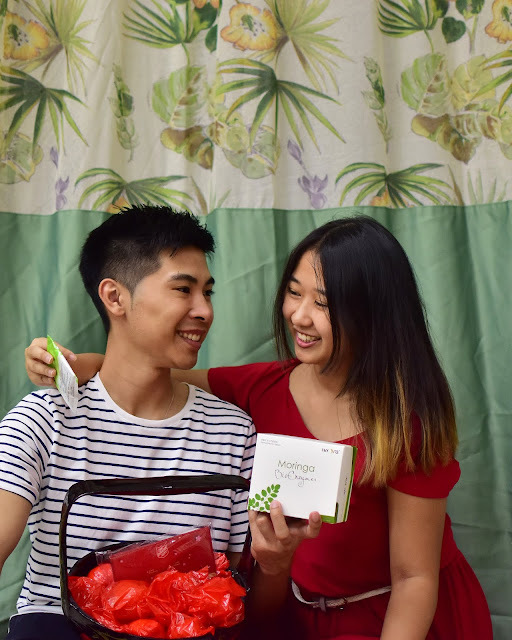 I ultimately decided I needed to actually go through a routine and carried out a 7-step Korean skin care routine which I blogged about before. That routine was the discipline my skin needed to finally figure itself out and ultimately clear the heck up. 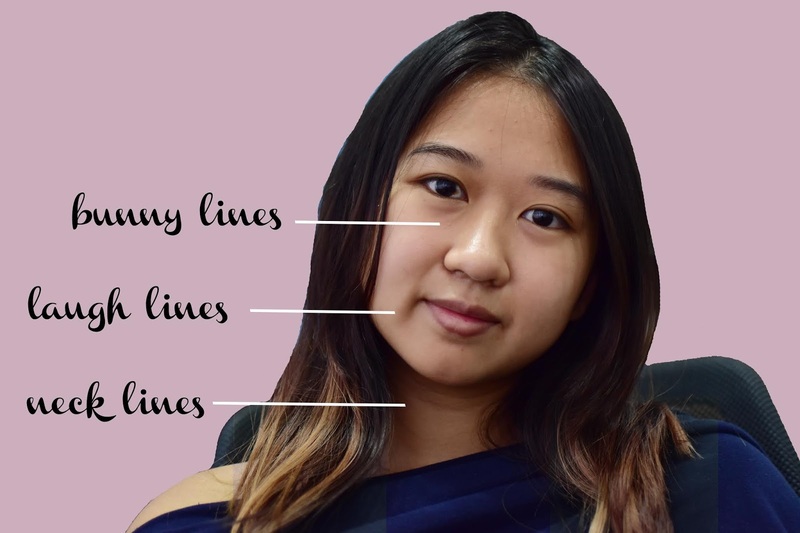 Since then, I’ve toned it down to a basic 3 step routine with Althea’s Bare Essentials and my skin’s balanced enough to handle new products and substitutions, which is where the fun really began! I never truly understood how people could spend so much time, effort and money on skincare till I started paying attention to my skin. Good skin can make it look like a late night didn’t happen. Having hydrated skin actually helps me emote more because I don’t feel that stretch against my mouth and cheeks when I’m smiling too much (I don’t know if this is an actual problem that other people have lol). I definitely feel confident about being bare faced when I’m zit-free and I guess it’s just really nice when you look in the mirror and feel like you’ve got it together. So listen up, folks! If you haven’t started caring for your skin, it’s worth making the investment now. If your skin is perfectly fine on its own, at the very least, invest in some sunblock, a good cleanser/micellar water and a reliable moisturiser. Don’t go crazy all at once with serums, ampoules and what have you because there’s an entire host of disadvantages to clogging up your pores, but I truly wish I started earlier and am here to make. a. point. So according to my research online, there are many types of wrinkles due to different reasons. Some are caused by environmental factors like too much sun and smoke, etc, whilst others are due to unavoidable elements of gravity and declining collagen with age. Some wrinkles are the face tattoos of happy times, leaving creases around the mouth and eyes which crinkle when we laugh. And some are just because of silly things like us pushing our faces against our pillows when we sleep or frowning when we work, which could leave permanent lines between our brows. Terrible life hack: grow a unibrow and that wrinkle would not be an issue. 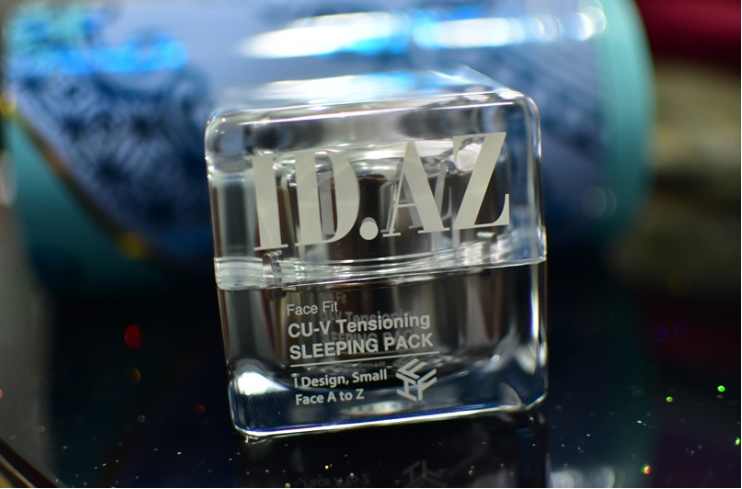 Anyway, I went on this entire tirade and specifically pointed out my wrinkles to introduce ID.AZ’s Face Fit - CU-V Tensioning Sleeping Pack (Phew - what a mouthful!). This Korean, quick-absorbing, gloriously mild smelling and indulgently rich moisturiser comes in the most satisfying packaging. Housed in a glass-like cube, opening and closing this is an absolute dream. Call me dramatic, but every time I use it and feel the satisfying twist of the cap falling into place, I feel like I just solved a Rubik’s cube LOL. ID.AZ makes bold claims with this sleeping pack. It promises to improve skin density, improve a sagging face, lifts and promotes anti-aging. They even patented their formula for lifting, which honestly gets the law nerd in me all excited. 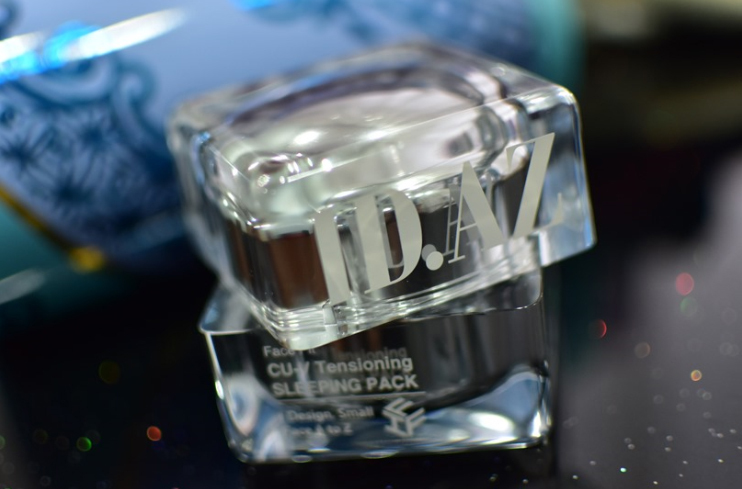 It claims to help with smoothing wrinkles by enhancing elastin formation, and even helps you slim your face and get that desired K-popstar V-shape. For all of that, a jar of this is going for RM169.15 at Watson’s (it normally retails for RM199!) and is available both online and in stores. Having used it for about two weeks, I gotta confess that in the first few days, I wasn’t impressed. I had just gone through ankle surgery and was completely bed ridden for a number of days, which meant that I spent 95% of my time in an air conditioned room, with my skin feeling dried out and bloated from the surgery. Using the sleeping pack just felt like I was slathering butter onto a dry piece of toast that simply did not want to soak it in and considering how bloated my face was, a V-shape outcome was definitely not going to happen. That was a total bummer because I wasn’t keen to write about this moisturiser that I thought was pretty mediocre. I don’t know what changed or whether it was just an adjustment period, but after using it for a few days, my skin started loving it. I felt a noticeable tightening of my skin and though I can’t say whether I have a slimmer face due to the product because coincidentally, the bloating post-surgery started coming down, I really like how my skin feels in the morning. 1. It’s a pretty rich moisturiser, so there is some sort of oily feeling leftover. But I think that’s why it’s a sleeping mask rather than a day-use moisturiser. For the first few days, I woke up and felt like it left 0 effect on my skin. But by the fourth day of use, by the time I woke up, it felt perfectly absorbed onto my skin without any oiliness leftover and my skin felt smooth and plump. 2. Once again, not a great experience in the first few days where I developed two pimples after starting to use it. But after that initial adjustment, it’s been completely fine and no abnormal break outs. 3. This is the best part for me because I don’t have sensitive skin but I do have sensitive eyes. So a lot of the time, some facial moisturisers are great for my skin, but they make my eyes sting! I wake up with puffier eyes than when I went to bed and whatever positive effect on the other parts of my face feel neutralised because I keep having to rub my eyes throughout the day. This moisturiser cause no irritation to my eyes whatsoever. 4. 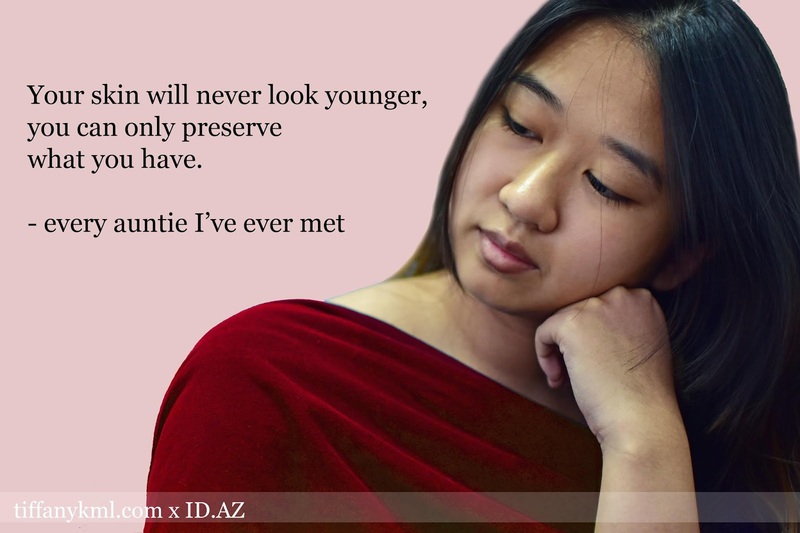 ID.AZ’s promises of a slimmer face and reduced wrinkles seem like a tall order, especially when I grew up believing that once your wrinkles come, your only saviour is a good face lift/fillers or Botox. I personally haven’t seen any reduction in my wrinkles as shown above, but I do feel its firming effects and am pretty confident that if I keep using it, it’ll be able to help me reduce the development of further wrinkles and fine lines. Also it doesn’t have an overly strong smell in the best possible way, which to me, is a pretty good feature. So all in all, a solid night time moisturiser. 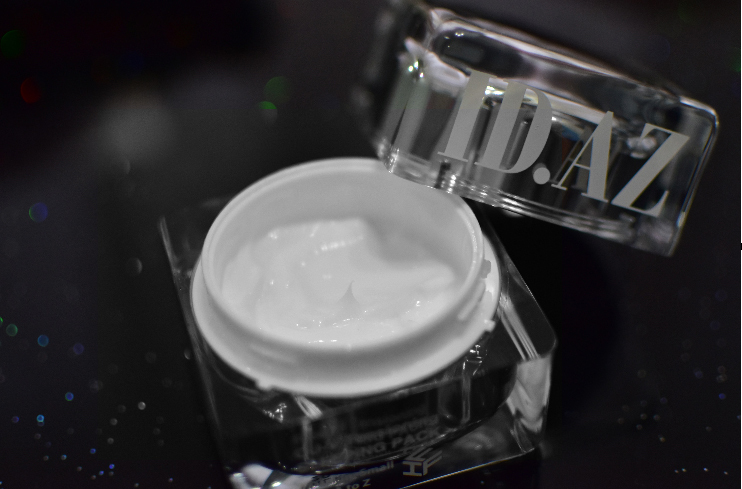 Took a few days to adjust to it, but now that I have, I’m pretty happy to introduce it to my routine as my go-to moisturiser, specifically because of its firming effect. If you want one of your own, feel free to check it out online or in stores at Watson’s. If there’s a tester at Watson’s physical stores, don’t forget to fiddle with the jar to experience the satisfaction of its packaging. And well, yes, test it out. Thanks for the free jar, ID.AZ!